Ebola virus disease (EVD) is severe, frightening, and often rapidly fatal. Yet even decades after it was identified, little is known about how this hemorrhagic scourge cascades through the bodies of its victims. In a big step to close that knowledge gap, more than a dozen scientists from the Pacific Northwest National Laboratory (PNNL) joined colleagues at the University of Wisconsin-Madison and elsewhere in a landmark study of blood samples from a recent West African outbreak of EVD. They accomplished a deep analysis of enzymes, lipids, immune system-related molecules, and other blood-borne factors that might signal the disease's progress. The paper, published November 16 in the journal Cell Host & Microbe, expands our currently limited knowledge of human EVD pathogenesis. It may also facilitate the future development of prophylactic or therapeutic countermeasures, saving countless lives. Among other discoveries and insights, the authors found two biomarkers that suggest which patients will die, and 11 biomarkers that distinguish fatal from non-fatal cases. EVD is severe, aggressive, and often fatal. It begins with flu-like symptoms and over the course of two to three weeks progresses to diffuse bleeding, shock, vomiting, and fever. Among those infected, from 25 to 90 percent die. Developing future countermeasures includes identifying candidate Ebola biomarkers, said co-author Jason Wendler, a senior scientist at PNNL who designed the paper's statistics, machine learning, and data analysis. "The remarkable aspect of this work is that we utilized the very cutting edge of instrumentation, mathematics, and biomedicine to make new discoveries about EVD," he said. "We discovered molecules that in these patients would have been early indicators for who is at greatest risk of death." "Ebola virus disease promoted profound changes in lipid metabolism," said Jennifer Kyle. She is a PNNL lipidomics scientist now leading the analysis of lipids from the Ebola blood samples. In the current paper, PNNL's share of the effort focused on using a multi-platform ‘omics analysis approach to generate high-quality, parallel omics datasets to share with the research community; to facilitate new hypothesis development; and to provide a standard for comparison with datasets generated in animal models of EVD pathogenesis or in other human disease systems. ‘Omics refers to analytical technologies in systems biology that are used to study the function of genes, proteins, metabolites, and other components of an organism. Based on patient samples from three hospitals in Sierra Leone, the study could also provide an important data-based community resource for medical researchers who want to further analyze the severity of this catastrophic hemorrhagic illness. PNNL had a big part. "Our team studied thousands of molecular clues in each of these samples, sifting through extensive data on the activity of genes, proteins, and other molecules to identify those of most interest," said co-author Katrina Waters, PNNL's division director for Biological Sciences. "This may be the most thorough analysis yet of blood samples of patients infected with the Ebola virus." The paper's authors-from Wisconsin, the Icahn School of Medicine at Mount Sinai, the University of Tokyo, and the University of Sierra Leone-include 15 PNNL researchers. Wendler is a co-first author, along with Kyle and Kristin E. Burnum-Johnson. The study's samples-29 from survivors, 10 from a healthy control group, and nine from fatalities - came from patients infected near the 2015 peak of an outbreak that started in 2013 and tapered off nearly three years later. By the end it caused more than 23,000 laboratory-confirmed cases and upwards of 11,000 deaths, primarily in the West African nations of Guinea, Liberia, and Sierra Leone. The outbreak, though tragic, also created a natural experiment that allowed researchers to study EVD and collect blood samples as the disease rolled through local populations at the rate of 400 cases a week. EVD was first described following two 1976 outbreaks in central Africa. Yet even decades later its pathogenesis remains poorly defined, said Wendler. The Cell Host & Microbe paper helps clarify how EVD cascades into fatality within the human body by investigating how molecular-level host responses contribute to the disease. "The ‘omics technology provides us with a global view-everything we can measure," he said, even though blood is such a complicated medium as Ebola sets its hook and alters affected organs. "It's quite a complex puzzle, something that's unique to this catastrophe and to these peoples' bodies." The study's analysis of the ‘omics datasets established the data quality, said Wendler, and also revealed the utility of omics analyses for gaining insights into how EVD develops. The study emphasizes the value of this approach when compared to single omics analyses performed in isolation. The new paper further underscores the importance of the multi-platform approach because of its biomarker prediction analysis. Researchers assert that assumed biomarkers derived from multiple data platforms can unequivocally differentiate EVD survivors and fatalities as soon as patients are admitted for treatment. At PNNL, some of the analysis was done at the Environmental Molecular Sciences Laboratory, a national scientific user facility. In addition to identifying biomarkers, the researchers' analysis suggested that strong innate immune cell activation and sepsis-like inflammatory responses are associated with EVD. Their plasma lipidomics dataset also revealed the lipid signatures of EVD. Hundreds of lipid species have been identified in the plasma of healthy humans. Alterations in various lipid species are associated with chronic disease conditions. The researchers explored their plasma proteomics datasets to identify enriched pathways in both EVD survivors and in EVD fatalities. 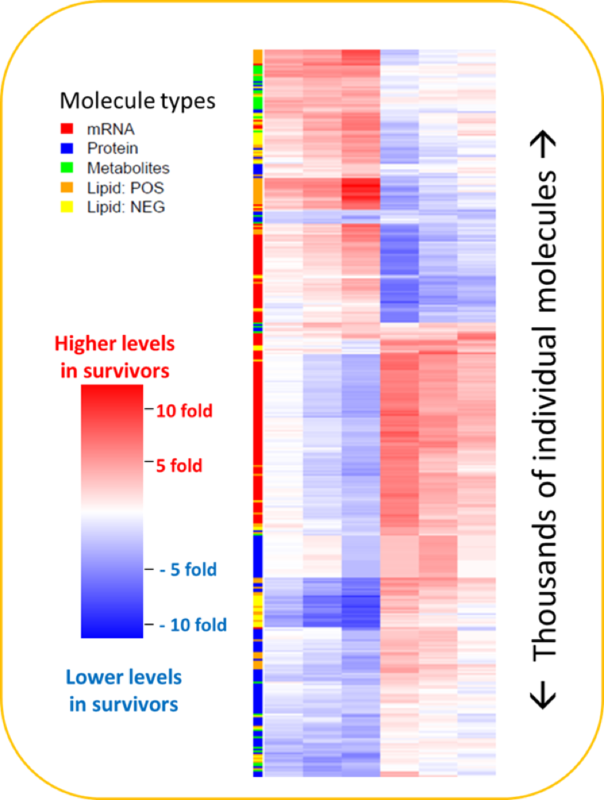 They found, for instance, that the "Pancreatic Secretion" pathway was significantly enriched in a proteomics comparison between EVD survivors and fatalities. Pancreatic enzymes leaking into the bloodstream of infected patients contributed to the disease's signature tissue damage. Follow-up papers are in the works, said Wendler, including those exploring Ebola-associated lipids (EVD causes changes to lipids associated with coagulation), a rapid biomarker that could be used in the field to test the severity of a given Ebola case, and a genome-wide association study (GWAS), with more patients. It helps, said Wendler, that "there are quite a few more samples in the freezers." They were collected in the field lab his Wisconsin colleagues set up in a military hospital in Freetown during the spring of 2015. Wendler acknowledged that the current paper suggests powerful new directions for study, even though it was based on just 48 samples. "There were a lot of measures," he said, thanks to omics technology and the deep-dive comparisons machine learning can do. "But from just a few samples." Sponsor: This study was funded by, among others, the National Institute of Allergy and Infectious Diseases at the National Institutes of Health. Proteomics and metabolomics analyses were performed at the Environmental Molecular Sciences Laboratory, a U.S. Department of Energy, Office of Biological and Environmental Research national scientific user facility located on the PNNL campus. Read the PNNL press release by Tom Rickey, a related article, and the University of Wisconsin-Madison press release.